I did the first ever Mad Dog and it was great. The thought of being a Mad Dog Ever Present appealed and for a few years it was all good, but holidays and diary clashes intervened, so now I have to settle for being a Nearly Ever Present. Still, it’s been great watching this fledgling event grow from nothing to one of the UK’s most popular 10Ks in just seven years. My training lately has been lots of long and slow as trying to do the short and fast thing doesn’t really agree with me. It’s too much like hard work. So as I stood in the Dalmatian pen (not as fast as a Greyhound, but faster than a Husky) I knew running 10km wasn’t going to be a big problem. It was running it fast that would be the hard bit. Away we went into the fine morning. Conditions were good. Congestion was as expected and not too bad, and it thinned out pretty quickly anyway. I was in no rush and settled down into a comfortable groove. This is a good race for spectators with opportunities to catch the race in more than one place if you do your homework. I spied Roberta standing on the pier where she, along with many other spectators, were spellbound by the entertainer high-fiving runners as they past underneath. It was Elvis. 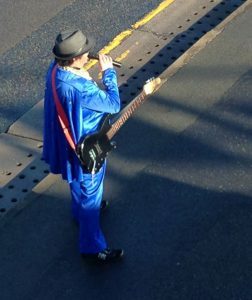 Possibly the same Elvis you see at the bus-shelter towards the end of the GNR. Or a close relation. And my word, what a talent! A performance never to be forgotten. Music was a big theme this year. It always is for the Mad Dog but this year the performances were exceptional. You get to see the fantastic steel band twice, once on the way out, and again in the last few kms. At the half-way point I was feeling pretty comfy and stepped up the pace a little. 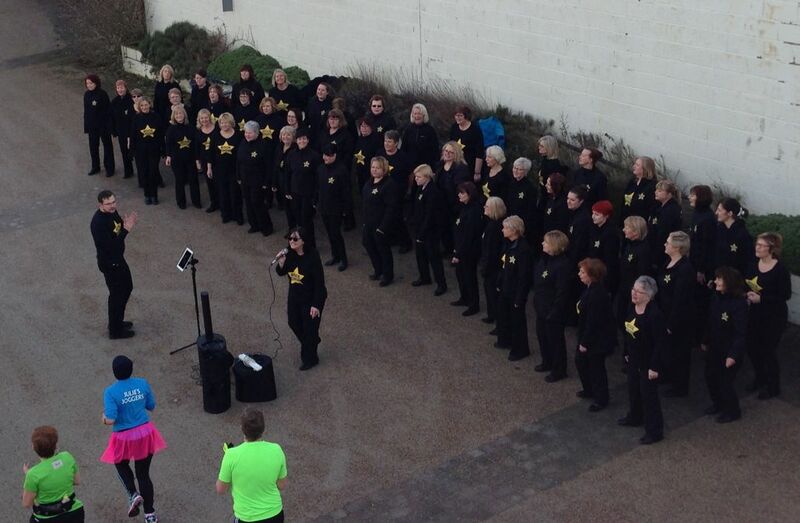 The route now meandered around to pass back under the pier at a different point where the Merseyside Rock Choir brought some real class to the party. I was feeling pretty good and bounded on although I was tempted to stop, look and listen. With about 3km to go I kept nudging the needle careful not to blow it and throttling back gently when I felt I was overdoing it. Passing runners steadily to the line I gave a well-judged push in the last few hundred metres, slightly alarmed that the Finish banner said Start, and hoping that the Finish wasn’t round the corner back at the school. It wasn’t and I was pretty pleased with running a text-book negative split. The last time I did this race I was pretty dismayed to be well over 50 minutes, and not having run a sub-25 parkrun for as long as I can remember I wasn’t expecting miracles today. So when the text came though of a chip-time of 48:35 I was a very happy dalmatian. 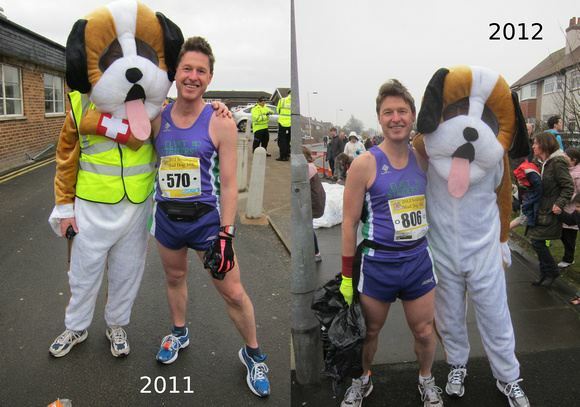 The Southport 10K run, aptly named ‘Mad Dog’, is into its fifth year now. The races inaugural year, 2011, seen it voted the best 10k run by Runner’s World magazine. 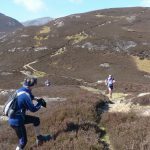 Indeed in 2014, the race was voted the best 10k run in the UK at the running awards, and has been shortlisted again for 2015. 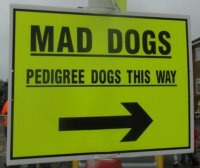 Keen to see what all the fuss was about, and coupled with the fact that my parents lived nearby, I registered for this year’s event – the opportunity to become a ‘Mad Dog’ and conqueror the coast of Southport, was too great a pull! Over 2500 runners took part in the race and I have to say the organisation of the event was superb. There was a designated car park for runners and spectators, which could be entered upon showing your race number. Then there was a free bus that took you from the car park to the start of the race. There was food stalls, changing facilities, showers – everything you required. The runners taking part in the race were divided into sections, based on ability; each section was given a colour as with other races. 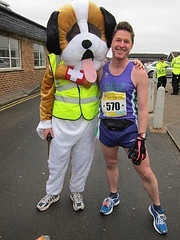 However, each section was also a dog breed, in keeping with the ‘Mad Dog’ theme – I was a Labrador!! There was a strong contingent from a number of running clubs; there were fun runners, charity runners and fancy dress runners – all were raring to go!! The course is a flat course along the coast of Southport; it is a road race, so no trail shoes are necessary. As the race started, the conditions were ideal – there was virtual no wind, a bit of dew in the air and low temperatures. The only downside was the mist, which obscured some of the views along the coast. The race started in good timely fashion and before I knew it I had complete the first kilometre. One thing I was keen to do this time, was to pace myself correctly. I tend to start running too quickly and burn out towards the end of the race. 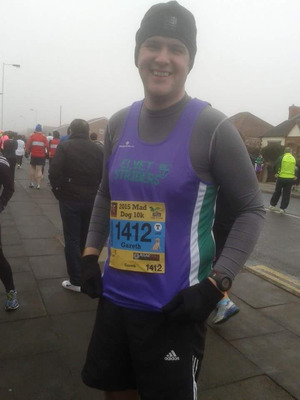 With the course being flat and the conditions being ideal, I was looking for a PB – my PB for a 10k race was 53:55 back in 2013. I started the race slowly and completed the first four kilometres in just under 22 minutes. The first 4k of the race is all along the coast road and is fairly straight. Just after 4k, you reach the furthest point on the course and you move slightly away from the coast and follow the road around the marine lake. As we made our way around the course, music blasted out for all to hear, there was steel drum bands beating their rhythm and other music stations to keep the runners motivated. 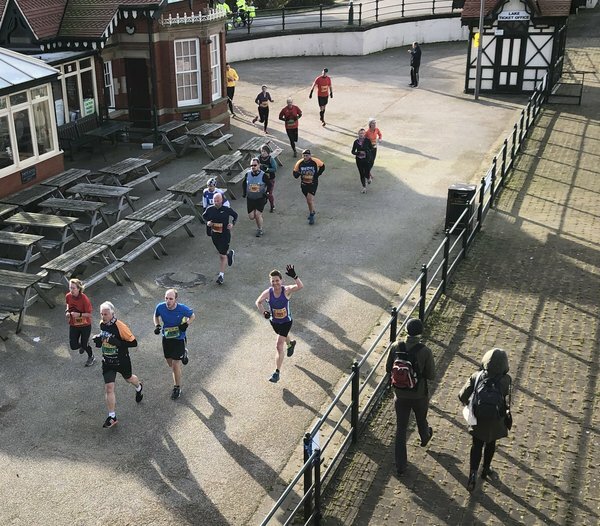 There was also great support and some amusing banners, one in particularly brought a chuckle to many a runner – it read ‘Please run quicker, we are cold’. Another funny moment was a fellow runner kitted out as Elvis singing at the top of his voice ‘You ain’t nothing but a hound dog’, very apt! By this time I was past the half-way point now and with 6 kilometres complete my time was a little on the slow side for a PB – I had 32:38 on the clock, but I felt good and I knew I had plenty left in the tank; so far I had paced myself well. I increased the length of my stride and pushed on. Once round the Marine lake we re-joined the original coast road and headed for the finish line. I had completed 8 kilometres now and my time was 42:43, I was going well. I pushed on, as barring injury; I knew I would achieve a new PB. Finally as we turned the corner onto the long home straight, I could see the finish line in the distance. I sprinted down the home straight, keen to gain every place I could for my final standing. I crossed the line with a time of 51:54; I had managed to beat my PB by 2 minutes. I ran the last two kilometres of the race in 9:20. As with most races these days you receive a ‘goody’ bag after crossing the finish line. You get the usual goodies, Medal, banana, a drink and a T-Shirt. However, the T-shirt does deserve a special mention for this race, as most T-shirts from these events can be pretty bland and boring. 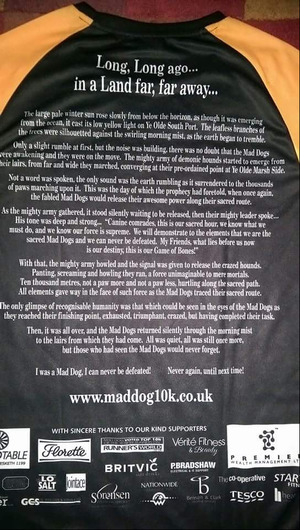 The Mad dog T-shirt was certainly not boring!!! I always take my running kit on holiday. Doesn’t matter where. There’s always the chance of a run, or even better, a race. 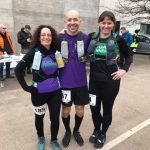 I nurture fond fantasies of running a race in some far away exotic place in my Striders vest and writing an ever so nonchalant, do this sort of thing all the time, race report. However, given some of the parkrun tourist reports we’ve had lately you’d have to go intergalactic nowadays if you wanted to win the accolade of Strider who has raced the furthest away from Durham. This holiday was no different. I packed my kit. 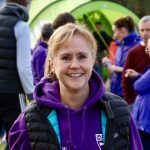 But this holiday was a biggie – we were going to a game reserve in South Africa for a fortnight, so, realistically, I should’ve realised that the chances of a training run would be limited. Or at least, quite literally, short-lived. Sure enough it became immediately clear that a jog round the local bushes would probably result in meeting some scary wild animals. And I’m really not very fast. I think a Cheetah would have the edge. 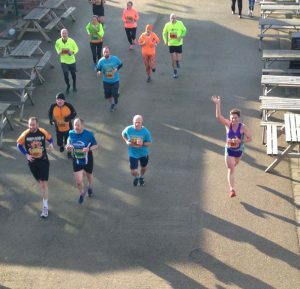 Nonetheless, despite a series of lacklustre parkruns and a two week hiatus in my running I turned up in Southport for my 4th Maddog 10k, optimistic that I would, despite all the evidence, pull something amazing out the bag. I had also, cunningly, decided to avoid the whole park and park-and-ride shuttle-bus stuff by cycling from my parents-in-law’s flat to the race start. I arrived nicely warmed up and stress-free. The race started right on schedule and I settled in the shelter of the congestion, satisfied in the knowledge that there’d be plenty of time to put the foot down later when I got into my stride. A sharp left onto the seafront and straight into the wind. I tried to remember what Allan and Ian said about cutting into the wind on the track, but whatever I did just seemed to be met with a squally blast. Plus my nose was running and I was paranoid about how to address that particular issue without causing a major incident. The 3km marker appeared and I took a glance at my watch and got a nasty surprise. I’d been prepared for a slowish time but assumed I’d still be comfortably sub-50. But now for the first time in 5 years it was looking like I was heading for a 10k time where the first digit was a 5. This was really most disagreeable. I tried to lift my pace a bit, but my pace was not for lifting. Still, when we hit the 5km marker we would turn round and the wind would hit us in the back. Sure enough, it was like cresting a summit on the bike and free-wheeling. I slipped into the big ring and increased the pace. 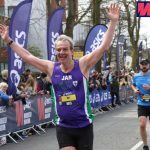 There were lots of bands and music this year and I began to feel a bit more upbeat as I hoofed it back to the finish, confident that even if I didn’t PB, I would at least be sub-50. Across the finish line and a glance at the watch. No, that couldn’t be right. That couldn’t be right at all. There had to be some mistake. I checked again: 52:29. I did a bit of that rueful-headshaking routine that you see top sportsmen doing, as if to suggest that there was some other sinister shadowy reason why my time was what it was. But it didn’t change anything. It was still there, beautifully pixellated. Nearly 5 minutes slower than last year, and a 5-year PW. I closed my eyes, drew back the curtain, to see for certain, what I thought I knew. Yup, the weather was minging. I was just so not in the mood to do a fast flat PB hunter’s 10K that I knew would be neither fast, nor a PB. I PB’d in 2011, then again in 2012. It wasn’t going to be three in a row. This was the third year of the Mad Dog and its most ambitious yet. Larger field, more road closures, and some other stuff. The biggest change was the introduction of park and ride, or, park, queue and ride, to give it a more accurate description. It was bad luck that the weather was so cold and damp and the organisers discovered in the morning that the buses were not allowed to go the quick route from carpark to the start so the queues to get back after the race were long and shivery. In a neat bit of PR one of the marshals walked along the queue apologising for the delay, chatting to the maddogs, listening and getting feedback and promising to get the glitches sorted for next year. I wasn’t too worried – we didn’t have to wait too long – and Roberta and I were both veterans from the Edinburgh 2009 marathon where the shuttle buses were hopelessly inadequate. So a 20 minute wait for a bus was no big deal, and it’s not as if you couldn’t walk to the park and ride, and many did. It was probably only 20 minutes. Might do that next year. They’ve made a few subtle but clever course changes. More road closures and imaginative route choices make this race a rare beast; a fast PB road race that is also an interesting course. Along the promenade, past a Steel Band (that’s new), and then the tell-tale sign that the race is really getting big. An Elvis. An Elvis singing “You ain’t nothing but a houndog” to those in suitable fancy dress. The last 3 km rejoined the outward course around the Steel Band point so we got another blast from them (they were great) and a long fast finish which was the same point as the start. Even in its far larger form (1700+ finishers) there were still space to run. I didn’t PB, but I was very happy with my 48:13 time, which was a lot faster than I expected, or deserved. It had been a good fast hard race and I love the excitement of running in a pack and still having space to overtake. But there was something missing. I showered, had a coffee, rumaged through my goodie bag, but something wasn’t quite complete. Where was he? I had my photos from 2011 and 2012, and, aha – there he was! Now I have one from 2013 too! My second running and the second running of this flat fast 10K. No wind this year, and conditions were right for a PB. I was out to beat my PB from 2011 and by as much as possible. At the half-way point I was well up on my best time and was feeling good so lifted the pace and turned for home. There’s a really nice section that runs around the lakes and over a wooden bridge that reminds me of the Parkrun ‘noisy’ bridge, except that it isn’t noisy. It should be though. The last few kilometres in perfect conditions and all the time trying to balance an optimum effort without burning out before the finish. It wasn’t quite there though. 2km to go and I latched on to someone who passed me. He would be my pacer. The gap was widening but he had a slim build and a distinctive gait. In my head a photoshopped a reddish wig and a raucous cackle and suddenly it was game on. I clung on all the way to the finish and my watch showed 46:59. Fairly pleased, but a PB by a smaller amount than I hoped, and, I thought, knowing my luck, the chip time will be 47:01. Sure enough. 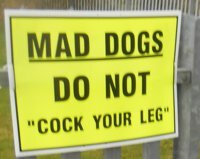 There’s something exciting about doing a race that’s never been run before and when they give it a name like the “Mad Dog 10K”, well it’s a no-brainer. My in-laws live in Southport and we’re down there a fair bit and I know the place pretty well. The course is flat, really flat, flat fast and a bit of a honey-trap for the PB hunter. The only hills are the footbridges over the lake. The forecast for Sunday was pretty dismal but it seems that at the last minute the rain decided to head for Newcastle Town Moor and do mischief there leaving Southport with a brief weather window where we were to remain dry albeit a little windswept. It was chip-timing so there was no need for an unseemly scramble on the start. There were no official road closures but thankfully there were plenty of marshalls and police around, which was handy for the first few kilometres where it would have been a dodgy squeeze trying to keep to the pavements. I was out for a PB and intended to get one but soon had my doubts as we headed south along the coast road into a strong headwind. I was running well and making steady gains but still couldn’t hit my target pace for a PB. At the 5km we turned inland and the wind hit us in the back and I stepped on the gas to see how much time I could claw back. I wasn’t sure it was possible but I was going to give it a go. This turned out be my favourite bit of the course with quirky turns and twists around Southport’s lake and pier and the Finish getting rapidly closer all the time. With the wind thumping me in the back all the way home I was chuffed to see my PB was back on and I was delighted to finish in 47:43. This race filled up weeks in advance and I’m sure it will become even more popular in the years to come. It is the fastest 10K course I’ve ever run and with chip timing and space to overtake it’s bound to be a hit. There were a few rough edges and I absolutely hated the sharp left-hander just a few yards from the Finish line, but it’s a fundamentally sound race and if you want a 10K PB then you could do worse than head to the Southport.